Reuben News for the Foodservice Industry. Sponsored by Frank's Kraut! 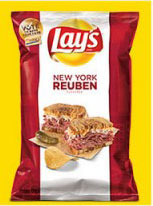 One of the top four user-submitted flavors to the Lay’s Do Us a Flavor potato chip challenge is the New York Rueben, and it’s on the grocery store shelves now. The Reuben sandwich chip hits the Reuben taste dead on, with the essence of pastrami, Thousand Island dressing, sauerkraut, cheese and rye bread.